CABLE HIGHLIGHTS: AMERICAN HORROR STORY was among the shows that took the holiday off, which left the way clear for Discovery’s ALASKAN BUSH PEOPLE to win the night at 0.97, down 0.02 from last week, while the network’s MEN WOMEN WILD downticked to 0.40. Cartoon Network’s REGULAR SHOW THE MOVIE was at 0.51, following a 0.45 lead-in from TEEN TITANS GO. There was more family entertainment in the Top 10 from a 10AM Nickelodeon DORA AND FRIENDS at 0.40. Univision had a LIGA MX soccer match at 0.49. Hallmark’s holiday movie of the night ONCE UPON A CHRISTMAS was at 0.47, with a huge 50+ audience of 2.21 that towered over its other demos. HGTV’s PROP BROTHERS was at 0.42. History aired an AMERICAN PICKERS clip show at 0.32. 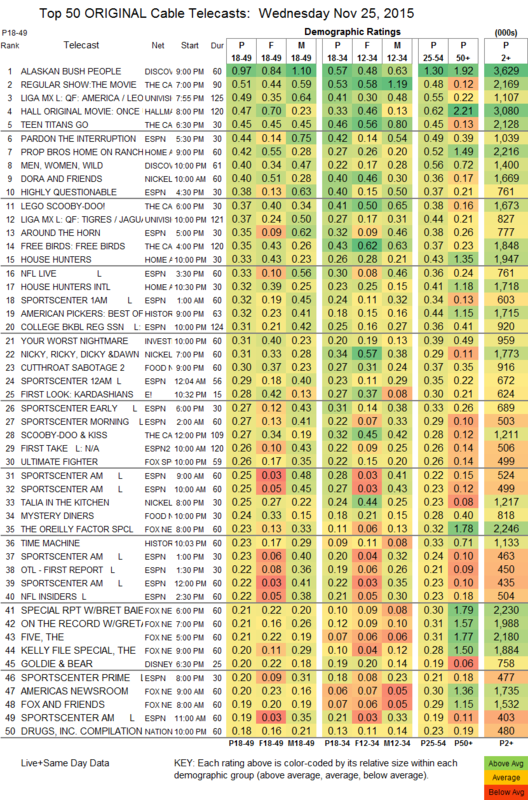 On Food Network, CUTTHROAT SABOTAGE fell 0.11 to 0.32 and MYSTERY DINERS was up 0.02 to 0.24. BET’s THE WESTBROOKS lost 0.02 to 0.15. 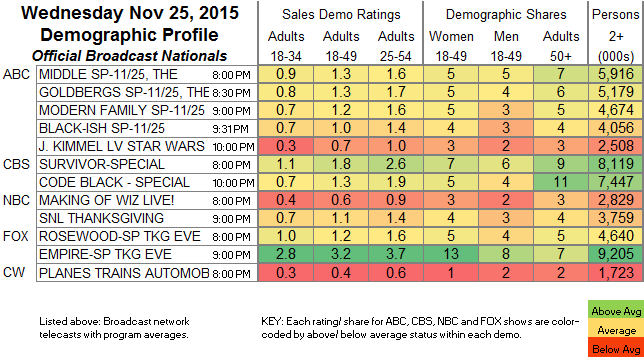 DAM’s IMPACT WRESTLING made the chart for its 9PM run, up 0.02 to 0.07, and it added 0.03/78K at midnight, while RING OF HONOR was up 0.01 to 0.05/141K.